Download the Plasmodium Consortium’s Policy Circular No 1. Hampshire College is proud to announce the founding of the world’s only academic program for non-human species. The first scholars-in-residence (faculty page here), plasmodial slime molds known as Physarum polycephalum, arrived from Carolina Biological Supply in Spring 2017, and moved into a dedicated office in Cole Science Center. Plasmodial slime molds are renowned for their ability to network, to learn, to survive adversity, and to navigate complex systems in an efficient and equitable way. The scholars are part of a year-long collaborative project, using their environmental intelligence and optimization skills to help us think through big human questions, from the relationship between self-interest and collective interest, to food scarcity in a time of climate change. Students, staff, and faculty will have various opportunities through courses, workshops and other events to bring their disciplinary perspectives and concerns to the project – from architecture and psychology to economics and photography – consulting the plasmodial slime mold for potential responses and solutions, and in turn informing a Gallery exhibition/intervention (February 1 – March 9, 2018) and public symposium (March 2, 2018). The aim of the project is to shift our usual perspectives and practices through truly unique collaborations, catalyzing unforeseen insights that may lead us in new directions. 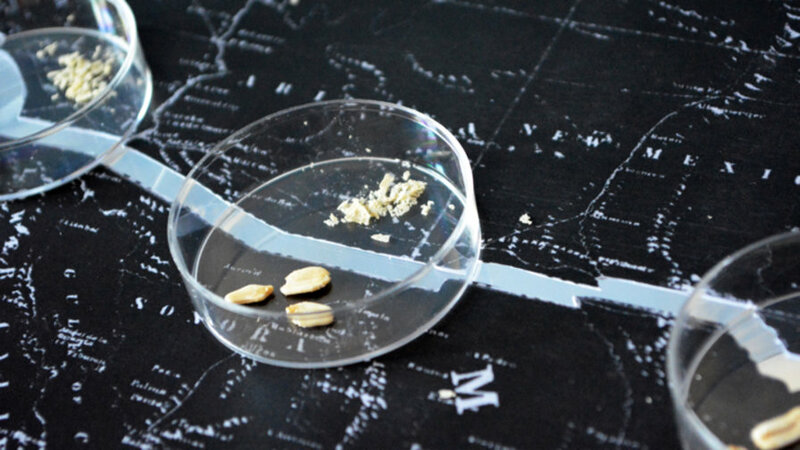 The Plasmodium Consortium is the brainchild of San Francisco-based experimental philosopher and conceptual artist Jonathon Keats, in collaboration with Hampshire College Art Gallery director Amy Halliday and biology professor Megan Dobro. Dedicated to rigor in research, Keats nevertheless positions his fiercely interdisciplinary thought experiments as in “defiance of a culture that increasingly forecloses on wonder, and silos knowledge into narrowly defined areas of expertise”. In the past few years he has choreographed ballet for honeybees, opened a photosynthetic restaurant serving gourmet sunlight to plants, attempted to genetically engineer God in a laboratory, and built cameras with a thousand-year-long exposure time, documenting the long-term effects of climate change. One of his cameras is currently installed in Stearns Steeple at Amherst College. His most recent book – You Belong to the Universe: Buckminster Fuller and the Future (2016) – explores anticipatory design in relation to the visionary architect and engineer. NEPR- Should We Model Human Behavior on a Brainless, Single-Cell Amoeba? This exhibition is supported in part by a grant from the Amherst Cultural Council, a local agency which is supported by the Massachusetts Cultural Council, a state agency. At Hampshire College, support comes from the School for Interdisciplinary Arts, the Culture, Brain, and Development (CBD) program, and Ethics and the Common Good (ECG) project, as well as MacArthur Faculty Development and Dr Lucy Faculty Research grants from the School of Natural Sciences. Filed under Past exhibition, Upcoming exhibition.